Owned By refers to a rare, final line of text found on Talismans. 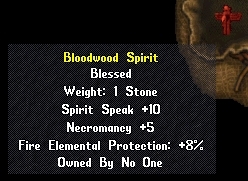 There is a small chance that a talisman, even a unique talisman, will spawn with the Item Property known as "Owned By." When a talisman with this property is equipped on a character, this property will change to "Owned By (Name of Character)" and will become blessed for that character. It cannot be looted. Talismans that have an owner cannot be equipped by any other character, and cannot be placed into a trade window. As such talismans are rare and blessed, the more desirable "Owned By" talismans command a high price. It should be noted that the Bloodwood Spirit talisman is so common that some have taken to locking down "Owned By" versions on their front steps. This page was last modified on 24 February 2010.